It was to be the first space mission for Hague, who joined NASA's astronaut corps in 2013 and just two minutes after lift off something was very wrong. The problem came two minutes into the flight: The rocket carrying an American and a Russian to the International Space Station failed Thursday, triggering an emergency that sent their capsule into a steep, harrowing fall back to Earth. The crew landed safely on the steppes of Kazakhstan, but the aborted mission dealt another blow to the troubled Russian space program that currently serves as the only link to deliver astronauts to the orbiting outpost. 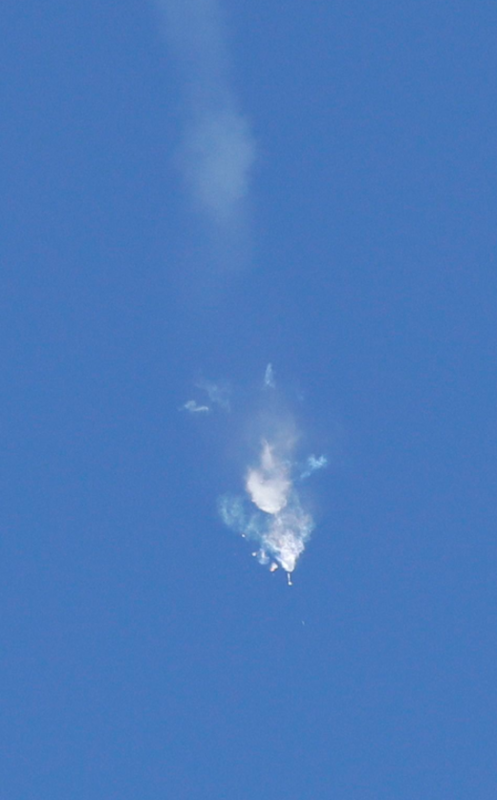 NASA astronaut Nick Hague and Roscosmos' Alexei Ovchinin had a brief period of weightlessness when the capsule separated from the malfunctioning Soyuz rocket at an altitude of about 50 kilometers (31 miles), then endured gravitational forces of 6-7 times more than is felt on Earth as they came down at a sharper-than-normal angle. 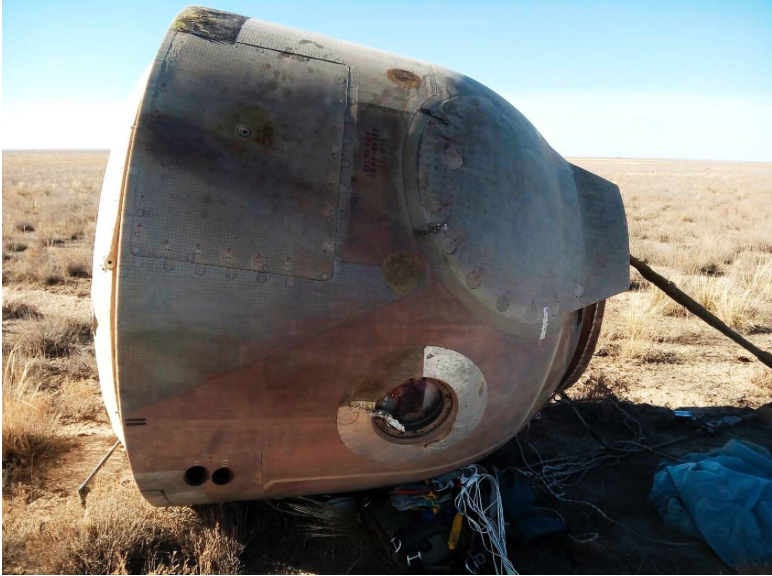 About a half-hour later, the capsule parachuted onto a barren area about 20 kilometers (12 miles) east of the city of Dzhezkazgan in Kazakhstan. "Thank God the crew is alive," said Dmitry Peskov, the spokesman for Russian President Vladimir Putin. He added that Putin received regular updates. New NASA Administrator Jim Bridenstine, who watched the launch at the Russian-leased Baikonur cosmodrome along with his Russian counterpart, said Hague and Ovchinin were in good condition. He added that a "thorough investigation into the cause of the incident will be conducted." All Russian manned launches will be suspended pending an investigation into the cause of the failure, said Deputy Prime Minister Yuri Borisov. Hague, 43, and Ovchinin, 47, lifted off as scheduled at 2:40 p.m. (0840 GMT; 4:40 a.m. EDT) from Baikonur. The astronauts were to dock at the space station six hours after the launch and join an American, a Russian and a German on board. But the three-stage Soyuz booster suffered an unspecified failure of its second stage two minutes after launch. Russian news reports indicated that one of its four first-stage engines might have failed to jettison in sync with others, resulting in the second stage's shutdown and activating the automatic emergency rescue system. Search and rescue teams were immediately scrambled to recover the crew, and paratroopers were dropped from a plane to reach the site quickly. Dzhezkazgan is about 450 kilometers (280 miles) northeast of Baikonur, and spacecraft returning from the space station normally land in that region. 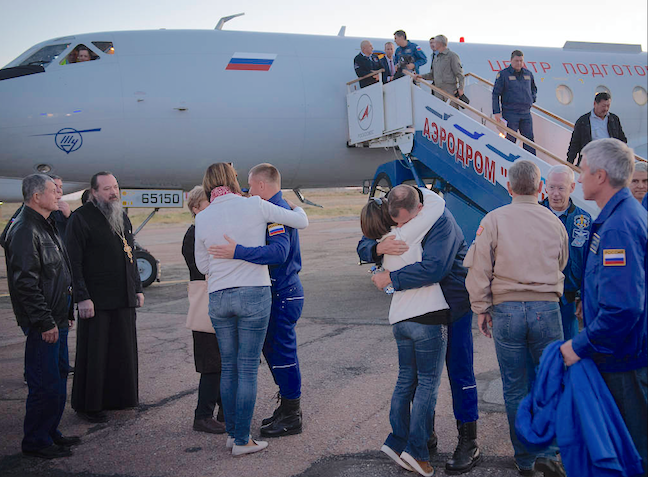 The astronauts were flown by helicopter to Dzhezkazgan, where they underwent a medical checkup and then taken by plane to Baikonur for more checks and to see their families. They will spend the night in Baikonur before being flown to Star City, Russia's space training center outside Moscow. 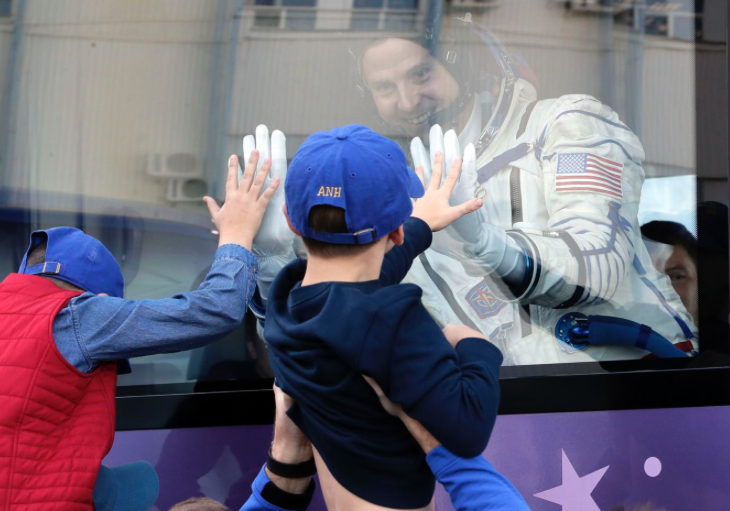 It was to be the first space mission for Hague, who joined NASA's astronaut corps in 2013. Ovchinin spent six months on the orbiting outpost in 2016. Oleg Orlov, the head of Russia's main space medicine center, said the higher-than-usual gravity load posed no threat to the astronauts, who have been trained to endure high g-forces. During the launch, astronauts wear spacesuits and are tightly strapped into their customs-made seats helping withstand the G-forces. Flight controllers kept the three space station residents abreast of the situation after Thursday's aborted launch. "The boys have landed," Mission Control assured the space station crew. "Glad our friends are fine," space station commander Alexander Gerst, a European Space Agency astronaut from Germany, tweeted from orbit. "Spaceflight is hard. And we must keep trying for the benefit of humankind." There was no immediate word on whether the space station crew might need to extend its own six-month mission. Two spacewalks planned for later this month were off indefinitely. Hague was supposed to be one of the spacewalkers. NASA said it's dusting off its plans for operating the space station without a crew, just in case the Russian investigation drags into next year. Kenny Todd, a space station manager, said from Houston that the three-member space station crew can stay on board until January. That's just a month beyond their expected mid-December return. Their Soyuz capsule is good for about 200 days in orbit. If the Soyuz rocket remains grounded until it's time for the astronauts to come home, flight controllers could operate the orbiting lab without anyone on board, Todd said. The space station could operate like that indefinitely, barring a major equipment failure, he added. But it will need to be staffed before SpaceX or Boeing launches its new crew capsules next year, Todd said. Given that the space station is a $100 billion asset, Todd says it needs to have someone on board for the arrival of the commercial demo missions, for safety reasons. While the Russian space program has been dogged by a string of launch failures and other mishaps in recent years, Thursday's incident marked the program's first manned launch failure since September 1983, when a Soyuz exploded on the launch pad. Borisov said Russia will fully share all relevant information with the U.S., which pays up to $82 million per ride to the space station. "I hope that the American side will treat it with understanding," he said. "We will naturally provide them with all the necessary information about what caused the failure." Earlier this week, NASA's Bridenstine emphasized that collaboration with Russia's Roscosmos remains important. Relations between Moscow and Washington have sunk to post-Cold War lows over conflicts in Ukraine and Syria, and allegations of Russian meddling in the 2016 U.S. presidential vote, but they have maintained cooperation in space research. The Russian Soyuz spacecraft is currently the only vehicle for ferrying crews to the space station following the retirement of the U.S. space shuttle fleet. Russia stands to lose that monopoly in the coming years with the arrival of SpaceX's Dragon and Boeing's Starliner crew capsules. The last time the Russian space program had a manned launch failure was in 1983. Soviet cosmonauts Vladimir Titov and Gennady Strekalov jettisoned and landed safely near the launch pad after the Soyuz explosion. "It's an unpleasant situation," Titov told the Tass news agency Thursday. "We went through it, and it was very bad." He added that it will take about a week for the crew to fully recover. In 1975, the failure of a Soyuz upper stage sent Vasily Lazarev and Oleg Makarov into a fiery fall to Earth from an altitude of 190 kilometers, subjecting them to enormous gravity loads that caused them to black out and temporarily lose eyesight. They landed on a snowy mountain slope and spent two nights shivering in the cold before rescue crews reached them. Russia has continued to rely on Soviet-designed booster rockets for commercial satellites, as well as crews and cargo to the space station. While Russian rockets had earned a reputation for reliability in the past, launch failures in recent years has called into doubt Russia's ability to maintain the same high standards of manufacturing. Glitches found in Russia's Proton and Soyuz rockets in 2016 were traced to manufacturing flaws. Roscosmos sent more than 70 rocket engines back to production lines to replace faulty components, a move that resulted in a yearlong break in Proton launches and badly dented Russia's niche in the global market for commercial satellite launches. In August, the space station crew spotted a hole in a Russian Soyuz capsule docked to the orbiting outpost that caused a brief loss of air pressure before being patched. Roscosmos chief Dmitry Rogozin has raised wide concern by saying that the leak was a drill hole that was made intentionally during manufacturing or in orbit. He didn't say if he suspected any of the station's crew. By Dmitry Lovetsky and Vladimir Isachenkov. Isachenkov reported from Moscow. Associated Press writer Jim Heintz in Moscow and Marcia Dunn in Cape Canaveral contributed.